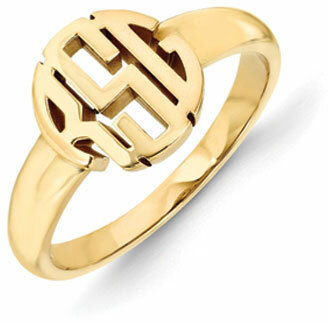 This unassuming gold ring may seem like it holds an artistic symbol at its center, when in fact it is a perfect replica of your initials in the form of a round monogram. This Classic Monogram Ring in 14K Gold is a wonderful ring to own as it holds such an important message about family and individuality. It is a stylish ring cast in beautiful yellow gold that makes for a very stylish accessory. The 14k yellow gold band measures 2mm to 3mm, as it widens slightly to curve toward the center of the ring. It features polished, rounded edges that glide nicely over the finger. On the face of the ring sits a chic monogram design measuring 10mm by 10mm and features up to three letters of your choice. These initials are arranged in a circular position which results in a truly unique pattern. The monogram is slightly elevated from the band, which gives the design a three-dimensional quality.